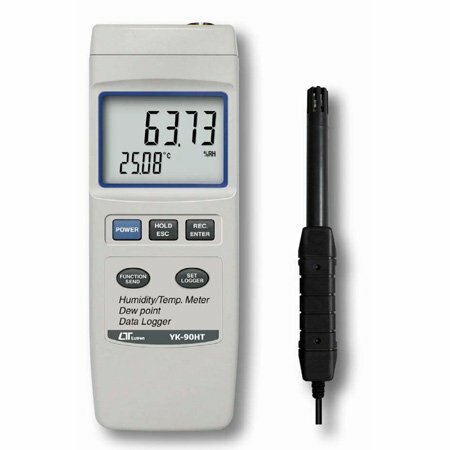 FEATURES * Professional Humidity measurement with fast response time. * Temperature measurement with ℃, ℉ unit. * Two displays, show Humidity/Temperature value at same time. * Bright LCD display. * Microprocessor circuit ensures high accuracy and provides special functions and features. * Data hold to freeze the display value. * Internal ℃, ℉ selection with default. * Auto power off saves battery life. * Operates from DC 1.5V ( UM4/AAA ) x 4 PCs batteries. Durable, long-lasting components, enclosed in strong, compact ABS-plastic housing. FEATURES * Fast humidity measuring response time. * Auto shut off saves battery life. * High accuracy and high precision. * Data hold function for freezing the desired value on display. * Dew point measurement. * Manual and auto manual data logger. * Show the humidity & temperature values on the LCD display at same time. * Data logger function with flexible sampling time selection, can save max. 1000 reading data with recall. * RS232 computer interface. * Built-in low battery indicator. Wide humidity & temp. measuring range. * Just few panel buttons, easy operation. * Microprocessor circuit assures maximum possible ccuracy, provides special functions and features. * Separate humidity & temp. probe, easy operation and remote measurement.